If you're creating systems that see, the Embedded Vision Summit is the place to be! 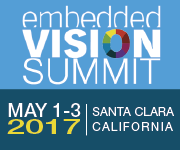 Plan now to join us May 1-3, 2017 in Santa Clara as stakeholders from every corner of the world's embedded vision ecosystem gather to examine the latest advances in computer vision, machine learning, and embedded intelligence. Super Earlybird registration rates are available for a limited time only using discount code nlevi0103, so register now to secure your place. Attend and take a deep dive into the latest innovations in computer vision enablement -- from processors and algorithms to software, sensors, and development tools and services. Meet the top technologists in this fast-growing field and network with the product and system design engineers, business leaders, suppliers, market analysts, entrepreneurs, and investors at the forefront of vision-based intelligence. Embedded vision applications, including autonomous vehicles, VR/AR, robotics, drones, security and surveillance, medical/healthcare, consumer electronics, manufacturing and control automation, and more. Embedded vision design and development techniques, including algorithms (e.g. : deep learning/CNNs), 3D perception, object/gesture recognition, low-power design options, hardware and component design/selection, deployment and scalability considerations, etc. Embedded vision business opportunities, including market research, business models, investment trends, and other profit-building insights.